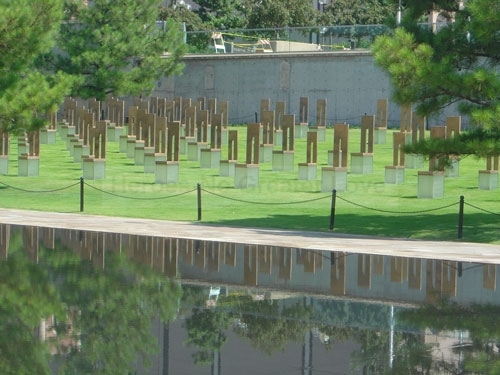 There is a chair for each of the loved ones lost during the disastrous bombing of the Oklahoma City Murrah Building in 1995. Please look closely to see the smaller chairs scattered in and about the larger chairs. These small chairs represent the children vicious murdered there that day. Seeing them and all the chairs that outline the memorial sends a very strong message to everyone that visits there that terrorism is disastrous and not to be tolerated. 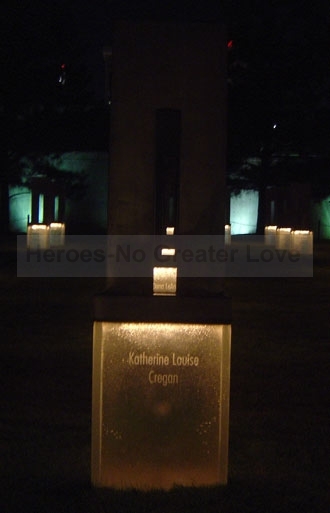 The picture above shows how the Reflecting Pool Chairs look at night, this picture is Katherine Louise Cregan's chair at the Memorial.